If you’ve enjoyed our shows of paintings and photographs in the past, you’ll really enjoy visiting Urban Forage this week. During the international ceramic art conference- NCECA- we’re hosting a curated show of ceramic art by Clay Arts Vegas until the end of day Saturday. There currently is work displayed by almost 80 artists from all over the country, and some from other countries as well! All are for sale- so feel free to peruse and buy, or just walk through and look wistfully. 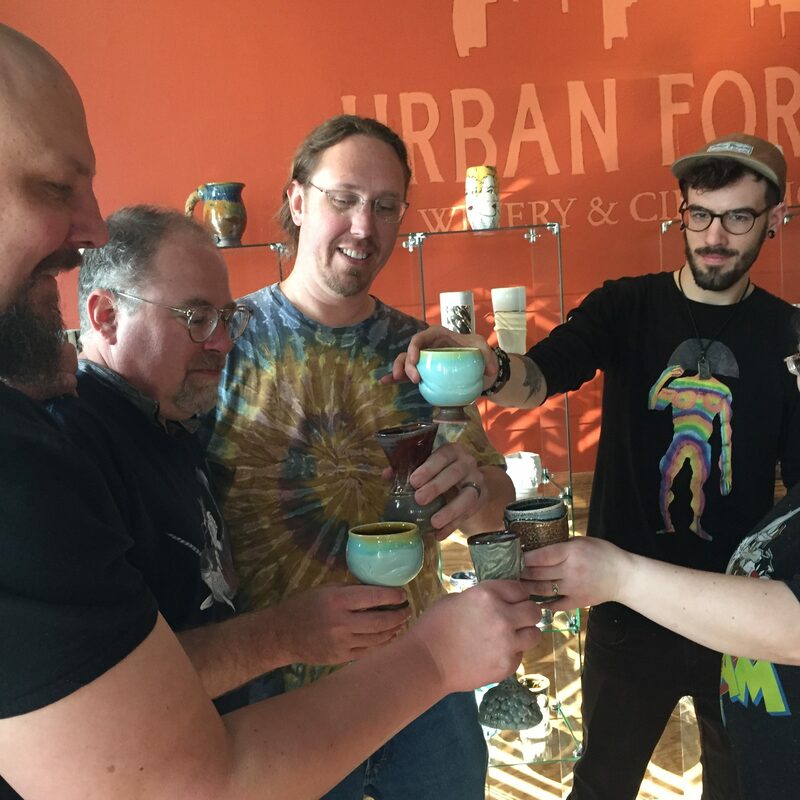 For the week, we will serve all drinks in hand-thrown ceramic mugs provided by Clay Arts Vegas’ artists. Beautiful and functional- we’re proud to be able to serve our beverages in works of art during this unique event. Thursday night may be- how shall I say- a tad busy? Clay Arts is hosting a shot glass exchange, there will be ceramic trivia, and Potter’s Pasties food truck will be on site to sling English hand pies! Come and join the fun, but don’t expect to find a chair. On tap, we currently have dry cider, hopped cider, winter spice cider and mead. Think of it as the intersection of spring and winter. Hopped for spring, and winter spice for the season we are quickly leaving behind. On the wine side, we’re serving our plum wine and rhubarb wine aside the Frontenac and sangria. A wine flight goes well with the exuberance of spring, and with this weather- I think we’ll be serving a lot of wine flights! Beyond this weekend- we’ll be having a ‘Fruit Cider Week’ for the second week of April. All fruit-based ciders will be on tap, with some favorites like pear cider and cherry-apple returning and the fantastic local folk duo Fellow Pynins will play on April 12. Spring will be in full bloom, and so will we! We hope to see you there.